This modern, spacious apartment with secure underground parking is located in the heart of the city centre; whilst also overlooking the River Clyde. Located just behind the St. Enoch Shopping Centre and Argyle Street, Glasgow’s premier shopping district, the apartment is only a 10 minute walk from the Merchant City and many of the finest restaurants and bars in Glasgow. The apartment is perfectly located to provide accommodation for the Commonwealth Games, offering easy access to many of the event venues. 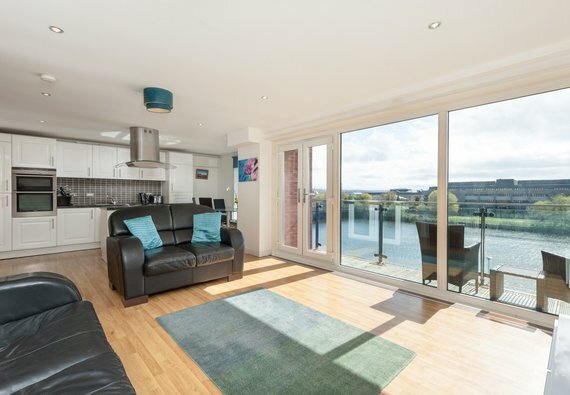 The apartment offers a spacious living/dining room/kitchen with patio doors leading to a balcony, which has panoramic views overlooking the River Clyde and many of the finest architectural buildings in the city. The large lounge and dining area has two large sofas, along with a dining table and chairs. The apartment also has Sky TV, which can be viewed in both the master and twin bedrooms in addition to the main living room. The master double bedroom has a king-size bed and en-suite shower room with w/c. The second twin bedroom has two single beds. Two additional guests can be accommodated using a sofa bed available for use in the living room, and there is an additional box room (without window), which can accommodate a child in a small single bed. In total the apartment can sleep a family of seven making it a very cost effective and flexible apartment for families and groups. A large family bathroom and large entry hallway with double-doors leading to the main living space and storage cupboards, complete the accommodation. Access to the property is via the secure entry door system with security codes and keyfob entry system. Lift access is available from 3 entry doors on Dunlop Street. A concierge service is also available weekdays from 9am until 5pm and 24 hour CCTV monitoring. The apartment is well serviced with public transport and by the motorway network. With Glasgow Central and Queen Street mainline train stations only a 10 minute walk, there are also two underground stations (St. Enoch and Argyle Street) close by and direct access to the main bus routes through the City Centre. The Apartment can also be accessed easily from the M8, M77 and M74 extension; and both Glasgow and Prestwick airports are easily accessible. Sleeping arrangements One king master bedroom with en suite, one twin room, one boxroom with a small single (best suited to a child), and one sofa bed in the living area. Exterior The property forms part of a modern complex on the riverside. Parking notes Secure electronically accessible basement garage, with designated, reserved parking space. Accessibility statement This property is located on one level, with lift access. Internet access/WiFi is available and can be provided by BT OpenZone at a daily additional rate. We stayed at the apartment for 3 nights and had a great time. The apartment was very clean and had everything we needed. Also within walking distance of the St Enoch Centre and Argyle St. Thomas was so nice and couldn't have been more helpful. We would definitely recommend this apartment. På tross av noen timer med strømproblemer er vi veldig fornøyde med vårt opphold. Thomas Moan, vår vert, var en veldig hjelpsom og hyggelig person. Det var som å møte en gammel venn.